"ICRC" redirects here. For other uses, see ICRC (disambiguation). The International Committee of the Red Cross (ICRC) is a humanitarian institution based in Geneva, Switzerland, and a three-time Nobel Prize Laureate. State parties (signatories) to the four Geneva Conventions of 1949 and their Additional Protocols of 1977 (Protocol I, Protocol II) and 2005 have given the ICRC a mandate to protect victims of international and internal armed conflicts. Such victims include war wounded, prisoners, refugees, civilians, and other non-combatants. The ICRC is part of the International Red Cross and Red Crescent Movement along with the International Federation of Red Cross and Red Crescent Societies (IFRC) and 190 National Societies. It is the oldest and most honoured organization within the movement and one of the most widely recognized organizations in the world, having won three Nobel Peace Prizes in 1917, 1944, and 1963. Up until the middle of the 19th century, there were no organized and well-established army nursing systems for casualties and no safe and protected institutions to accommodate and treat those who were wounded on the battlefield. In June 1859, the Swiss businessman Henry Dunant travelled to Italy to meet French emperor Napoléon III with the intention of discussing difficulties in conducting business in Algeria, at that time occupied by France. When he arrived in the small Italian town of Solferino on the evening of 24 June, he witnessed the Battle of Solferino, an engagement in the Second Italian War of Independence. In a single day, about 40,000 soldiers on both sides died or were left wounded on the field. Henry Dunant was shocked by the terrible aftermath of the battle, the suffering of the wounded soldiers, and the near-total lack of medical attendance and basic care. He completely abandoned the original intent of his trip and for several days he devoted himself to helping with the treatment and care for the wounded. He succeeded in organizing an overwhelming level of relief assistance by motivating the local population to aid without discrimination. Back in his home in Geneva, he decided to write a book entitled A Memory of Solferino which he published with his own money in 1862. He sent copies of the book to leading political and military figures throughout Europe. In addition to penning a vivid description of his experiences in Solferino in 1859, he explicitly advocated the formation of national voluntary relief organizations to help nurse wounded soldiers in the case of war. In addition, he called for the development of international treaties to guarantee the neutrality and protection of those wounded on the battlefield as well as medics and field hospitals. Directly following the establishment of the Geneva Convention, the first national societies were founded in Belgium, Denmark, France, Oldenburg, Prussia, Spain, and Württemberg. Also in 1864, Louis Appia and Charles van de Velde, a captain of the Dutch Army, became the first independent and neutral delegates to work under the symbol of the Red Cross in an armed conflict. Three years later in 1867, the first International Conference of National Aid Societies for the Nursing of the War Wounded was convened. Also in 1867, Henry Dunant was forced to declare bankruptcy due to business failures in Algeria, partly because he had neglected his business interests during his tireless activities for the International Committee. The controversy surrounding Dunant's business dealings and the resulting negative public opinion, combined with an ongoing conflict with Gustave Moynier, led to Dunant's expulsion from his position as a member and secretary. He was charged with fraudulent bankruptcy and a warrant for his arrest was issued. Thus, he was forced to leave Geneva and never returned to his home city. In the following years, national societies were founded in nearly every country in Europe. The project resonated well with patriotic sentiments that were on the rise in the late-nineteenth-century, and national societies were often encouraged as signifiers of national moral superiority. In 1876, the committee adopted the name "International Committee of the Red Cross" (ICRC), which is still its official designation today. Five years later, the American Red Cross was founded through the efforts of Clara Barton. More and more countries signed the Geneva Convention and began to respect it in practice during armed conflicts. In a rather short period of time, the Red Cross gained huge momentum as an internationally respected movement, and the national societies became increasingly popular as a venue for volunteer work. When the first Nobel Peace Prize was awarded in 1901, the Norwegian Nobel Committee opted to give it jointly to Henry Dunant and Frédéric Passy, a leading international pacifist. More significant than the honour of the prize itself, the official congratulation from the International Committee of the Red Cross marked the overdue rehabilitation of Henry Dunant and represented a tribute to his key role in the formation of the Red Cross. Dunant died nine years later in the small Swiss health resort of Heiden. Only two months earlier his long-standing adversary Gustave Moynier had also died, leaving a mark in the history of the Committee as its longest-serving President ever. In 1906, the 1864 Geneva Convention was revised for the first time. One year later, the Hague Convention X, adopted at the Second International Peace Conference in The Hague, extended the scope of the Geneva Convention to naval warfare. Shortly before the beginning of the First World War in 1914, 50 years after the foundation of the ICRC and the adoption of the first Geneva Convention, there were already 45 national relief societies throughout the world. The movement had extended itself beyond Europe and North America to Central and South America (Argentina, Brazil, Chile, Cuba, Mexico, Peru, El Salvador, Uruguay, Venezuela), Asia (the Republic of China, Japan, Korea, Siam), and Africa (South Africa). With the outbreak of World War I, the ICRC found itself confronted with enormous challenges which it could only handle by working closely with the national Red Cross societies. Red Cross nurses from around the world, including the United States and Japan, came to support the medical services of the armed forces of the European countries involved in the war. On 15 October 1914, immediately after the start of the war, the ICRC set up its International Prisoners-of-War (POW) Agency, which had about 1,200 mostly volunteer staff members by the end of 1914. By the end of the war, the Agency had transferred about 20 million letters and messages, 1.9 million parcels, and about 18 million Swiss francs in monetary donations to POWs of all affected countries. Furthermore, due to the intervention of the Agency, about 200,000 prisoners were exchanged between the warring parties, released from captivity and returned to their home country. The organizational card index of the Agency accumulated about 7 million records from 1914 to 1923, each card representing an individual prisoner or missing person. The card index led to the identification of about 2 million POWs and the ability to contact their families, as part of the Restoring Family Links effort of the organization. The complete index is on loan today from the ICRC to the International Red Cross and Red Crescent Museum in Geneva. The right to access the index is still strictly restricted to the ICRC. During the entire war, the ICRC monitored warring parties' compliance with the Geneva Conventions of the 1907 revision and forwarded complaints about violations to the respective country. When chemical weapons were used in this war for the first time in history, the ICRC vigorously protested against this new type of warfare. Even without having a mandate from the Geneva Conventions, the ICRC tried to ameliorate the suffering of civil populations. In territories that were officially designated as "occupied territories," the ICRC could assist the civilian population on the basis of the Hague Convention's "Laws and Customs of War on Land" of 1907. This convention was also the legal basis for the ICRC's work for prisoners of war. In addition to the work of the International Prisoner-of-War Agency as described above this included inspection visits to POW camps. A total of 524 camps throughout Europe were visited by 41 delegates from the ICRC until the end of the war. Between 1916 and 1918, the ICRC published a number of postcards with scenes from the POW camps. The pictures showed the prisoners in day-to-day activities such as the distribution of letters from home. The intention of the ICRC was to provide the families of the prisoners with some hope and solace and to alleviate their uncertainties about the fate of their loved ones. After the end of the war, the ICRC organized the return of about 420,000 prisoners to their home countries. In 1920, the task of repatriation was handed over to the newly founded League of Nations, which appointed the Norwegian diplomat and scientist Fridtjof Nansen as its "High Commissioner for Repatriation of the War Prisoners". His legal mandate was later extended to support and care for war refugees and displaced persons when his office became that of the League of Nations "High Commissioner for Refugees". Nansen, who invented the Nansen passport for stateless refugees and was awarded the Nobel Peace Prize in 1922, appointed two delegates from the ICRC as his deputies. The legal basis of the work of the ICRC during World War II was the Geneva Conventions in their 1929 revision. The activities of the Committee were similar to those during World War I: visiting and monitoring POW camps, organizing relief assistance for civilian populations, and administering the exchange of messages regarding prisoners and missing persons. By the end of the war, 179 delegates had conducted 12,750 visits to POW camps in 41 countries. The Central Information Agency on Prisoners-of-War (Zentralauskunftsstelle für Kriegsgefangene) had a staff of 3,000, the card index tracking prisoners contained 45 million cards, and 120 million messages were exchanged by the Agency. One major obstacle was that the Nazi-controlled German Red Cross refused to cooperate with the Geneva statutes including blatant violations such as the deportation of Jews from Germany and the mass murders conducted in the concentration camps run by the German government. Moreover, two other main parties to the conflict, the Soviet Union and Japan, were not party to the 1929 Geneva Conventions and were not legally required to follow the rules of the conventions. Marcel Junod, delegate of the ICRC, visiting POWs in Nazi Germany. On 12 March 1945, ICRC President Jacob Burckhardt received a message from SS General Ernst Kaltenbrunner accepting the ICRC's demand to allow delegates to visit the concentration camps. This agreement was bound by the condition that these delegates would have to stay in the camps until the end of the war. Ten delegates, among them Louis Haefliger (Mauthausen Camp), Paul Dunant (Theresienstadt Camp) and Victor Maurer (Dachau Camp), accepted the assignment and visited the camps. Louis Haefliger prevented the forceful eviction or blasting of Mauthausen-Gusen by alerting American troops, thereby saving the lives of about 60,000 inmates. His actions were condemned by the ICRC because they were deemed as acting unduly on his own authority and risking the ICRC's neutrality. Only in 1990 was his reputation finally rehabilitated by ICRC President Cornelio Sommaruga. On 12 August 1949, further revisions to the existing two Geneva Conventions were adopted. An additional convention "for the Amelioration of the Condition of Wounded, Sick and Shipwrecked Members of Armed Forces at Sea", now called the second Geneva Convention, was brought under the Geneva Convention umbrella as a successor to the 1907 Hague Convention X. The 1929 Geneva convention "relative to the Treatment of Prisoners of War" may have been the second Geneva Convention from a historical point of view (because it was actually formulated in Geneva), but after 1949 it came to be called the third Convention because it came later chronologically than the Hague Convention. Reacting to the experience of World War II, the Fourth Geneva Convention, a new Convention "relative to the Protection of Civilian Persons in Time of War," was established. Also, the additional protocols of 8 June 1977 were intended to make the conventions apply to internal conflicts such as civil wars. Today, the four conventions and their added protocols contain more than 600 articles, a remarkable expansion when compared to the mere 10 articles in the first 1864 convention. In celebration of its centennial in 1963, the ICRC, together with the League of Red Cross Societies, received its third Nobel Peace Prize. Since 1993, non-Swiss individuals have been allowed to serve as Committee delegates abroad, a task which was previously restricted to Swiss citizens. Indeed, since then, the share of staff without Swiss citizenship has increased to about 35%. On 16 October 1990, the UN General Assembly decided to grant the ICRC observer status for its assembly sessions and sub-committee meetings, the first observer status given to a private organization. The resolution was jointly proposed by 138 member states and introduced by the Italian ambassador, Vieri Traxler, in memory of the organization's origins in the Battle of Solferino. An agreement with the Swiss government signed on 19 March 1993, affirmed the already long-standing policy of full independence of the Committee from any possible interference by Switzerland. The agreement protects the full sanctity of all ICRC property in Switzerland including its headquarters and archive, grants members and staff legal immunity, exempts the ICRC from all taxes and fees, guarantees the protected and duty-free transfer of goods, services, and money, provides the ICRC with secure communication privileges at the same level as foreign embassies, and simplifies Committee travel in and out of Switzerland. The ICRC continued its activities throughout the 1990s. It broke its customary media silence when it denounced the Rwandan Genocide in 1994. It struggled to prevent the crimes that happened in and around Srebrenica in 1995 but admitted, "We must acknowledge that despite our efforts to help thousands of civilians forcibly expelled from the town and despite the dedication of our colleagues on the spot, the ICRC's impact on the unfolding of the tragedy was extremely limited." It went public once again in 2007 to decry "major human rights abuses" by Burma's military government including forced labour, starvation, and murder of men, women, and children. Fernanda Calado (Spain), Ingeborg Foss (Norway), Nancy Malloy (Canada), Gunnhild Myklebust (Norway), Sheryl Thayer (New Zealand), and Hans Elkerbout (Netherlands). They were shot at point-blank range while sleeping in the early hours of 17 December 1996 in the ICRC field hospital in the Chechen city of Nowije Atagi near Grozny. Their murderers have never been caught and there was no apparent motive for the killings. Rita Fox (Switzerland), Véronique Saro (Democratic Republic of Congo, formerly Zaire), Julio Delgado (Colombia), Unen Ufoirworth (DR Congo), Aduwe Boboli (DR Congo), and Jean Molokabonge (DR Congo). On 26 April 2001, they were en route with two cars on a relief mission in the northeast of the Democratic Republic of Congo when they came under fatal fire from unknown attackers. Ricardo Munguia (El Salvador). He was working as a water engineer in Afghanistan and travelling from Kandahar to Tirin Kot with local colleagues on 27 March 2003 when their car was stopped by unknown armed men. He was killed execution-style at point-blank range while his colleagues were allowed to escape. He was 39 years old. The killing prompted the ICRC to temporarily suspend operations across Afghanistan. Thereby the assumption that ICRC's reputation for neutrality and effective work in Afghanistan over the past thirty years would protect its delegates was shattered. By taking part in the 1995 ceremony to commemorate the liberation of the Auschwitz concentration camp, the President of the ICRC, Cornelio Sommaruga, sought to show that the organization was fully aware of the gravity of The Holocaust and the need to keep the memory of it alive, so as to prevent any repetition of it. He paid tribute to all those who had suffered or lost their lives during the war and publicly regretted the past mistakes and shortcomings of the Red Cross with regard to the victims of the concentration camps. The original motto of the International Committee of the Red Cross was Inter Arma Caritas ("Amidst War, Charity"). It has preserved this motto while other Red Cross organizations have adopted others. Due to Geneva's location in the French-speaking part of Switzerland, the ICRC is also known under its initial French name Comité international de la Croix-Rouge (CICR). However, the ICRC has three official languages (English, French and Spanish). 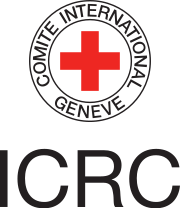 The official symbol of the ICRC is the Red Cross on white background (the inverse of the Swiss flag) with the words "COMITE INTERNATIONAL GENEVE" circling the cross. Under the Geneva Convention, the red cross, red crescent and red crystal emblems provide protection for military medical services and relief workers in armed conflicts and is to be placed on humanitarian and medical vehicles and buildings. The original emblem that has a red cross on a white background is the exact reverse of the flag of neutral Switzerland. It was later supplemented by two others which are the Red Crescent, and the Red Crystal. The Red Crescent was adopted by the Ottoman Empire during the Russo-Turkish war and the Red Crystal by the governments in 2005, as an additional emblem devoid of any national, political or religious connotation. The ICRC is the only institution explicitly named in international humanitarian law as a controlling authority. The legal mandate of the ICRC stems from the four Geneva Conventions of 1949, as well as its own Statutes. The ICRC also undertakes tasks that are not specifically mandated by law, such as visiting political prisoners outside of conflict and providing relief in natural disasters. Contrary to popular belief, the ICRC is not a sovereign entity like the Sovereign Military Order of Malta and also it is not an international organization, neither of non-governmental nor of governmental type. The ICRC limits its membership to Swiss nationals only, and also unlike most NGOs[citation needed] it does not have a policy of open and unrestricted membership for individuals as its new members are selected by the Committee itself (a process called cooptation). However, since the early 1990s, the ICRC employs persons from all over the world to serve in its field mission and at Headquarters. In 2007, almost half of ICRC staff was non-Swiss. The ICRC has special privileges and legal immunities in many countries,[which?] based on national law in these countries, based on agreements between the ICRC and the respective governments, or, in some cases, based on international jurisprudence (such as the right of ICRC delegates not to bear witness in front of international tribunals). The ICRC's operations are generally based on international humanitarian law, primarily comprising the four Geneva Conventions of 1949, their two Additional Protocols of 1977 and Additional Protocol III of 2005, the Statutes of the International Red Cross and Red Crescent Movement, and the resolutions of the International Conferences of the Red Cross and Red Crescent. The 2010 budget of the ICRC amounts to about 1156 million Swiss francs. All payments to the ICRC are voluntary and are received as donations based on two types of appeals issued by the Committee: an annual Headquarters Appeal to cover its internal costs and Emergency Appeals for its individual missions. The total budget for 2009 consists of about 996.9 million Swiss Francs (85% of the total) for field work and 168.6 million Swiss Francs (15%) for internal costs. In 2009, the budget for field work increased by 6.9% and the internal budget by 4.4% compared to 2008, primarily due to above-average increases in the number and scope of its missions in Africa. The ICRC is responsible for legally recognizing a relief society as an official national Red Cross or Red Crescent society and thus accepting it into the movement. The exact rules for recognition are defined in the statutes of the movement. After recognition by the ICRC, a national society is admitted as a member to the International Federation of Red Cross and Red Crescent Societies (the Federation, or IFRC). The ICRC and the Federation cooperate with the individual national societies in their international missions, especially with human, material, and financial resources and organizing on-site logistics. According to the 1997 Seville Agreement, the ICRC is the lead Red Cross agency in conflicts while other organizations within the movement take the lead in non-war situations. National societies will be given the lead especially when a conflict is happening within their own country. In the early years, every Committee member was Genevan, Protestant, white, and male. The first woman, Renée-Marguerite Cramer, was co-opted in 1918. Since then, several women have attained the Vice Presidency, and the female proportion after the Cold War has been about 15%. The first non-Genevans were admitted in 1923, and one Jew has served in the Assembly. While the rest of the Red Cross Movement may be multi-national, the Committee believes that its mono-national nature is an asset because the nationality in question is Swiss. Thanks to permanent Swiss neutrality, conflicting parties can be sure that no one from "the enemy" will be setting policy in Geneva. The Franco-Prussian War of 1870–71 showed that even Red Cross actors (in this case National Societies) can be so bound by nationalism that they are unable to sustain neutral humanitarianism. From 2000 to 2012, the President of the ICRC was Jakob Kellenberger, a reclusive man who rarely made diplomatic appearances, but was quite skilled in personal negotiation and comfortable with the dynamics of the Assembly. Since July 2012, the President has been Peter Maurer, a Swiss citizen who is a former Secretary for Foreign Affairs. He was appointed by the Assembly for a renewable four-year term. By virtue of its age and its special position under international humanitarian law, the ICRC is the lead agency in the Red Cross Movement, but it has weathered some power struggles within the movement. The ICRC has come into conflict with the Federation and certain national societies at various times. The American Red Cross threatened to supplant the ICRC with its creation of the International Federation of Red Cross and Red Crescent Societies as "a real international Red Cross" after the First World War. Elements of the Swedish Red Cross desired to supplant the Swiss authority of the ICRC after WWII. Over time the Swedish sentiments subsided, and the IFRC grew to work more harmoniously with the ICRC after years of organizational discord. Currently, the IFRC's Movement Cooperation division organizes interaction and cooperation with the ICRC. In 1997, the ICRC and the IFRC signed the Seville Agreement which further defined the responsibilities of both organizations within the movement. According to the agreement, the Federation is the lead agency of the movement in any emergency situation which does not take place as part of an armed conflict. From its inception in 1930 until 2006, the Magen David Adom organization, the Israeli equivalent to the Red Cross, was not accepted as part of the Federation, as it used the Star of David, which the ICRC refused to recognize as an acceptable symbol. This meant that although Arab ambulances would be protected by the ICRC, Israeli ambulances would not. In May 2000, Bernadine Healy, the President of the American Red Cross, wrote: "The international committee's feared proliferation of symbols is a pitiful fig leaf, used for decades as the reason for excluding the Magen David Adom – the Shield (or Star) of David." In protest over the ICRC's perceived anti-Israel discrimination, the ARC withdrew its financial support. In 2005, at a meeting of nations party to the Geneva convention, the ICRC adopted the new Red Crystal. Magen David Adom then centered the Star of David sign inside the newly accepted signage, and in 2006 was accepted as a full member. Yonatan Yagodovsky, director of MDA's fundraising department, said in an article published in October 2011 that "MDA will continue to use its emblem and logo, and no one ever asked us to take it off." The Nobel Peace Prize ceremony in 1963 when the prize was jointly awarded to the ICRC and the Federation. From left to right: King Olav of Norway, ICRC President Leopold Boissier, League Chairman John MacAulay. The ICRC prefers to engage states directly and relies on low-key and confidential negotiations to lobby for access to prisoners of war and improvement in their treatment. Its findings are not available to the general public but are shared only with the relevant government. This is in contrast to related organizations like Doctors Without Borders and Amnesty International who are more willing to expose abuses and apply public pressure to governments. The ICRC reasons that this approach allows it greater access and cooperation from governments in the long run. When granted only partial access, the ICRC takes what it can get and keeps discreetly lobbying for greater access. In the era of apartheid South Africa, it was granted access to prisoners like Nelson Mandela serving sentences, but not to those under interrogation and awaiting trial. After his release, Mandela publicly praised the Red Cross. The presence of respectable aid organizations can make weak regimes appear more legitimate, according to Fiona Terry, who contends that "this is particularly true of [the] ICRC, whose mandate, reputation, and discretion imbue its presence with a particularly affirming quality." Recognizing this power, the ICRC can pressure weak governments to change their behavior by threatening to withdraw. As mentioned above, Nelson Mandela acknowledged that the ICRC compelled better treatment of prisoners and had leverage over his South African captors because "avoiding international condemnation was the authorities' main goal." In a controversial move, three officials from the Palestinian political movement Hamas, which many governments have designated as a terrorist organization, have been living at the International Red Cross office in Jerusalem. Israel believes that these three officials had a role in the 2006 kidnapping of Israeli soldier Gilad Shalit, and has issued deportation orders for them. Red Cross spokesperson Cecilia Goin, in speaking with CBN News, said that hosting the Hamas officials is in line with the organization's humanitarian mission. Israel arrested two of the Hamas members for conducting "Hamas activities inside Jerusalem," said the police. ^ "Annual Report 2016, Key facts and figures" (PDF). ^ "Discover the ICRC". 2007. Retrieved 2009-05-12. p.6. ^ "PageNotFound - IFRC". Retrieved 17 April 2016. ^ "Nobel Laureates Facts – Organizations". Nobel Foundation. Retrieved 2009-10-13. ^ "Convention for the Amelioration of the Condition of the Wounded in Armies in the Field. Geneva, 22 August 1864". Geneva, Switzerland: International Committee of the Red Cross ICRC. Retrieved 2017-06-11. ^ "The Chaco war (1932-1935)". 2005-01-25. Retrieved 17 April 2016. ^ The Report of the International Committee of the Red Cross on its activities during the second world war (September 1, 1939 – June 30, 1947) Geneva 1948. 1948. ^ Mégevand-Roggo, Béatrice. Srebrenica – remembering the missing. 5 July 2005. ^ François Budnion (30 April 1997). "17 December 1996 : Six ICRC delegates assassinated in Chechnya". www.icrc.org. ICRC. Retrieved 4 September 2018. ^ "ICRC in WW II: the Holocaust". Retrieved 2012-08-28. .
^ Buignion, François (2002-11-05). "Dialogue with the past: the ICRC and the Nazi death camps". Retrieved 2007-10-19. .
^ ICRC: Official Statement (27 January 2005). "Commemorating the liberation of Auschwitz". Archived from the original on 10 December 2012. Retrieved 19 October 2007. ^ "Emblem". International Committee of the Red Cross. 2014-07-28. Retrieved 17 April 2016. ^ ICRC. The Mission.. 7 May 2006. ^ "International Committee of the Red Cross". 3 October 2013. ^ ICRC. 1 Jan 1995. The Fundamental Principles. ^ ICRC. 1 Dec 2009 Key Data for ICRC Emergency and Headquarters Appeals 2010. ^ ICRC. 1 Jan 2006. The members of the International Committee of the Red Cross. ^ ICRC names new president. 19 October 2011. Retrieved 4 January 2013. ^ "Democratic Republic of the Congo/South Sudan: 61 children reunited with their families". 2012-02-06. ^ "MDA symbol on ambulances in Yesha still unresolved". Archived from the original on 8 November 2011. Retrieved 6 October 2011. ^ Mandela, Nelson (10 July 2003), Speech before the British Red Cross, London . ^ Mandela, Nelson (16 May 2000), Interview on Larry King Live, CNN . ^ "Int'l Red Cross Sheltering Hamas Terrorist Officials". Retrieved 17 April 2016. ^ Sharona Schwartz. "Israeli Police Arrest Hamas Politicians Hiding for More Than a Year at…the Red Cross". The Blaze. Archived from the original on 9 November 2012. Retrieved 17 April 2016.
International Committee of the Red Cross: "Discover the ICRC", ICRC, Geneva, 2007, 2nd edition, 53 pp. International Review of the Red Cross An unrivalled source of international research, analysis and debate on all aspects of humanitarian law, in armed conflict and other situations of collective violence. Wikimedia Commons has media related to International Committee of the Red Cross. Legacy Dr. Cornelio Sommaruga, President of the ICRC from 1987–1999, donated four hours of high-definition audiovisual life story interviews to Legacy. The ICRC audiovisual library houses copies of these interviews.